Harbisson, shown speaking at Digital Village in Mexico last year, uses an antenna implant to 'hear' color. If you've ever wanted the directional superpowers of a homing pigeon, Cyborg Nest has a $425 wearable implant for you. It's called North Sense. “It does one simple thing,” co-founder and CEO Liviu Babitz told Bloomberg Businessweek. “A short vibration every time you're facing north.” Babitz, who was fitted for one in December, says it's more impressive than it sounds, likening it to a sixth sense. 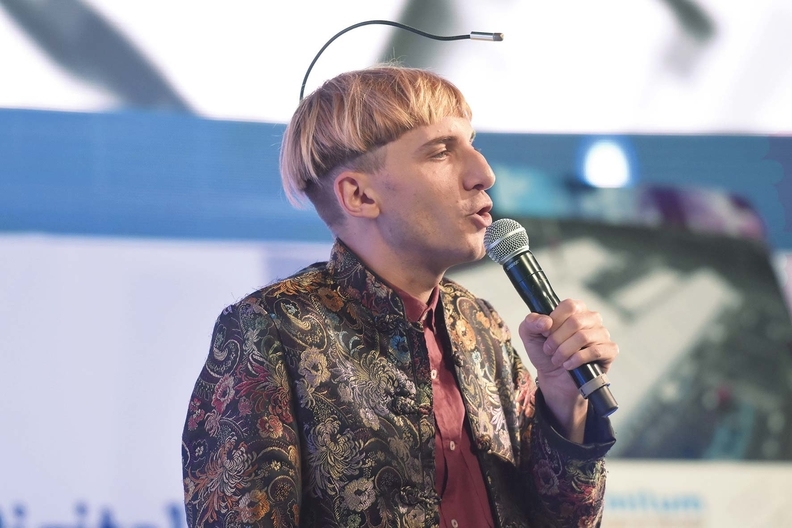 Neil Harbisson, 34, is a cyborg artist at the London-based company and the first legally recognized cyborg. Born colorblind, he designed an antenna that translates colors into one of 360 musical tones he's memorized. He persuaded a surgeon to drill into his skull, implant a chip, fuse an antenna to his occipital bone, and now he can hear colors and “connect to satellites to sense colours from space,” according to the company website. Cyborg Nest is manufacturing kits similar to those Harbisson uses to bring their vision of transhumanism into the mainstream. The company has already sold about 1,000 implants that vibrate when a wearer faces north. They advise having a professional piercer affix the devices. The company has a bold vision of the future: Bluetooth teeth for silent communication, environmental sensors to detect pollution, and eyes in the back of your head are just a few items on its wish list, all in the name of adjusting a person's mental perspective. “Modifying our minds is what really changed us,” Harbisson said. Tesla CEO Elon Musk told the Guardian told the Guardian these kinds of alterations are necessary for human evolution. He argues that humans must augment their capabilities through a “merger of biological intelligence and machine intelligence” and that failing to do this we will become “house cats” to artificial intelligence.